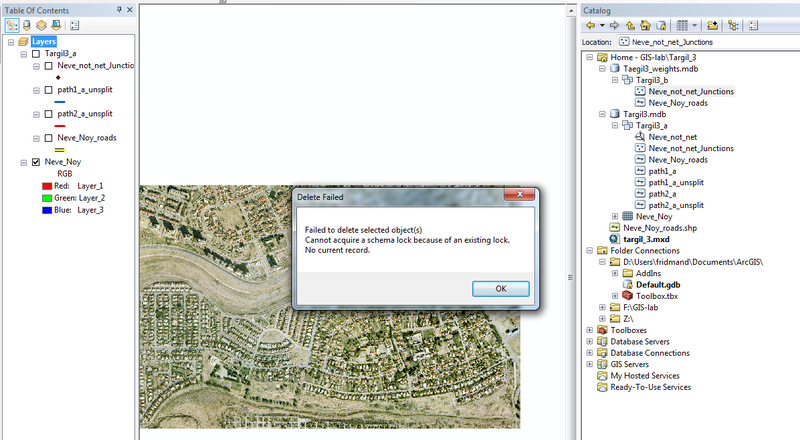 I have the feeling that both errors are related but couldn't figure out the problem from ESRI help or from other posts in gis.stackexchange. Close all ESRI applications. Then only start the one where you will do the editing (eg. Arcmap). This will release all locks that are on your data from other applications, which are interfering with your data manipulation. If it still doesn't work, also try to restart your computer. Please try to open Access table and delete unnecessary field or change data type PGDB to shape file and delete field. Not the answer you're looking for? Browse other questions tagged arcgis-desktop arcgis-10.2 personal-geodatabase schema-locks or ask your own question. Understanding Error network dataset has no edge elements It may be unbuilt? Geometric Network for Electric Utilities?